Remember yesterday when I said that we’d be looking at ways of keeping the action moving soon? well, we’re almost there, and a key element of that is going to be covered today. You need choice to deal with different situations, you need input to be able to make a choice, but without a looping mechanism, the program will still end when you get to the end o the program. Well, now we’re going to look at looping and looping through a special construct called an array (we’ve dealt with them before, but now we’re looking at them specifically and defining them ,too 🙂 ). In this exercise we are going to take various arrays and we are going to build them, “loop” through them and print out the values. We’re going to start off with a specific kind of looping command called the for command (or the for-loop if you prefer). 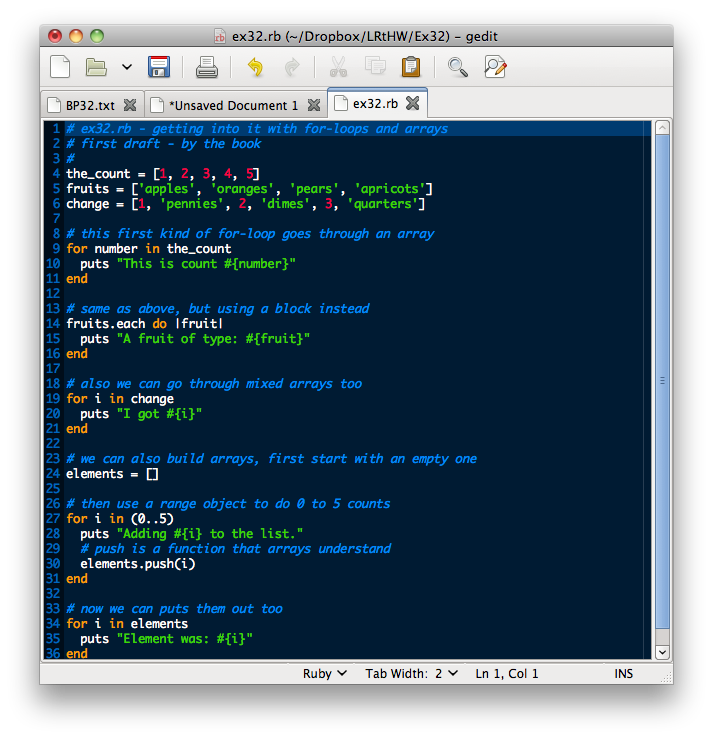 Syntactically, we are using a square bracket to start, or open, the array, then we put individual values into slots using ‘single’ quote characters for strings, or by themselves if they are digits/integers, and each element is separated by a comma. We close the array with a right bracket. 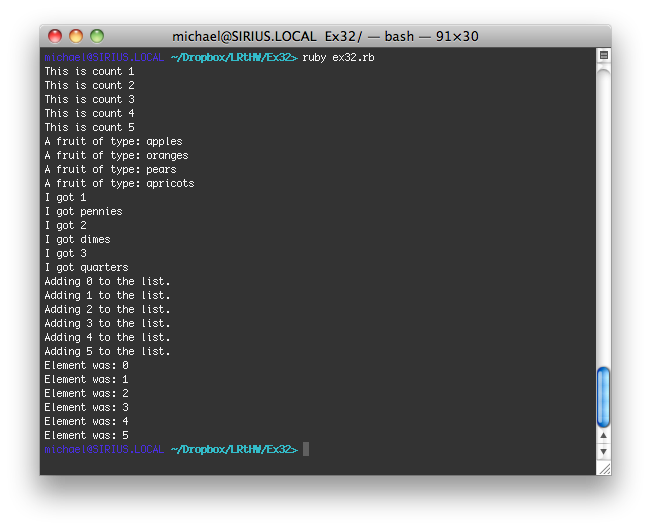 Ruby then takes the entire array, and all of the separated variables, and it assigns it to a single variable name. In this example hairs has the values of brown, blond, and red in three separate slots. Adding 0 to the list. Adding 1 to the list. Adding 2 to the list. Adding 3 to the list. Adding 5 to the list. Take a look at how you used the range (0..5). Look up the Range class to understand it. [ Range allows us to use a shorthand so that we can declare a beginning point and an end point and automatically iterate it. In languages like C we would declare a value, say how high we want the value to iterate, and then use and incrementer. The Range option allows us to do that all by decaring the range like 1..5. In C, this would be the same as a=1; a <= 5; a++) ]. Could you have avoided that for-loop entirely on line 24 and just assigned (0..5) directly to elements? 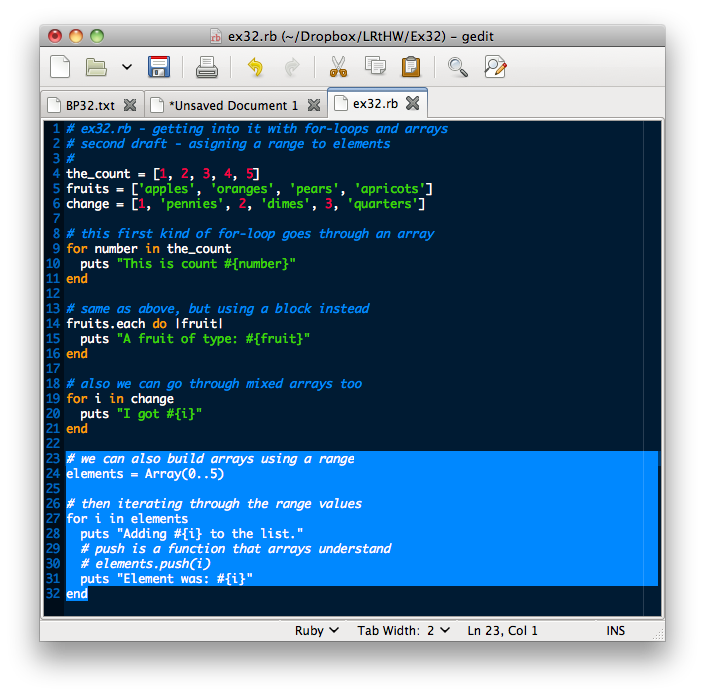 Find the Ruby documentation on arrays and read about them. 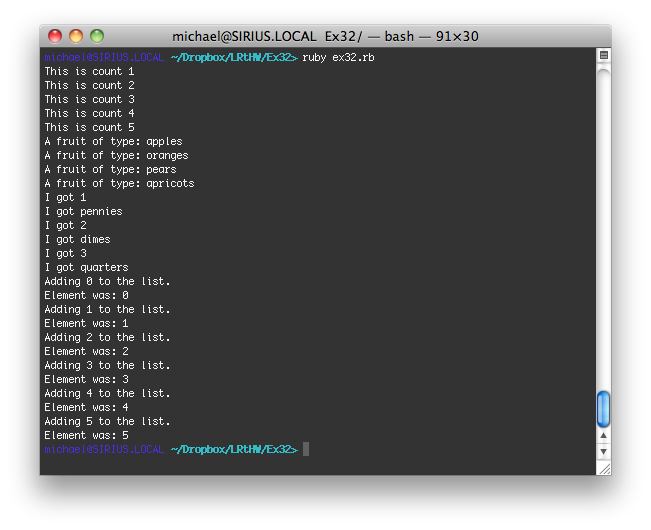 What other operations can you do to arrays besides push? 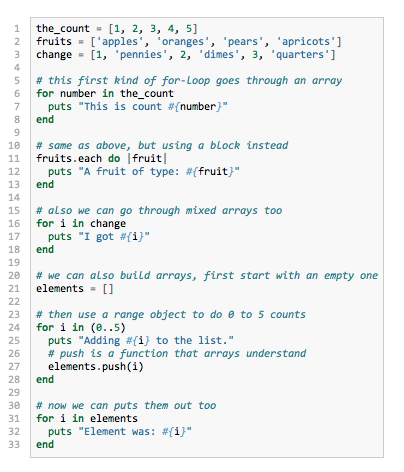 Loops in Ruby are an example where the language presents itself much more compactly than, say, C or Java. I like the “for x in y” structure and it’s cool how it can also take range assignments and apply them. From here, we can combine for loops with other actions and that will allow us to iterate through options. this is definitely helpful if we want to go through something multiple times in rapid succesion. Arrays allow us a way to store lots of information in a single variable space, an reference and manipulate items with a lot of built in functionality.